You might be interested in knowing about the pros and cons of using weed control fabric. You will find rolls of weed control fabric being sold online by gardening accessory retailers. You normally put a landscape fabric down between the soil and your mulch and you cut little holes in it and plant your plants in it and it's supposed to prevent weeds. There are pros and cons to everything and landscape fabric isn’t an exclusion too given that it has its own positive and negative sides as well. You will find many suggesting that the cons of using landscape fabric definitely outweigh the pros with this material, but again you know it's for you to decide. When you first put landscape fabric down and plant your plants and mulch over it, there is going to be a period of time where you're going to have less weeds. That is very true! It does prevent weeds that are in that existing soil from coming up through that new mulch and through to your new plants. 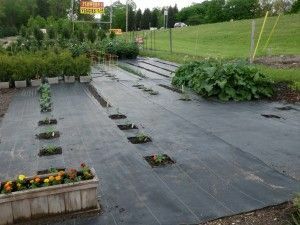 The problem however is that, as birds drop seeds, your mulch breaks down on top of the fabric and eventually you have an environment where weeds are going to come up anyway which leads to the second advantage of using landscape fabric. That is, when the weeds first germinate, if you get them pretty quickly then they're very easy to pull on top of this landscape fabric. They first get down to this fabric and then they have to start spreading outward and that gives you a period of time where they're just kind of easy to really get out of the ground very quickly. Without this underneath it, they get down in the soil pretty quick and they're much more difficult to pull out. You also pull up a lot of soil when you do it and that soil probably has weed seeds in it as well and it'll start to germinate. But the problem though is, if you don't get the weeds quickly, they actually get down to this and as this material breaks down a little bit, they can actually start rooting into this fabric and when you go to pull them out, it will rip your fabric up. You have to get the weeds quickly for it to be an advantage.